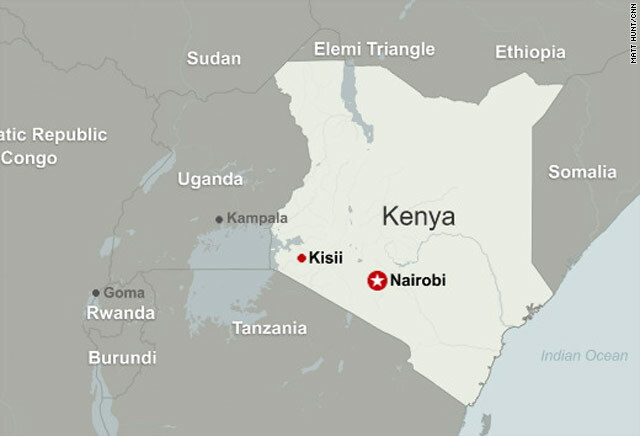 Kisii, Kenya (CNN) -- On one Sunday each month Pastor Lawrence Omambia, the lead preacher at the Community of Christ church in Kisii, Kenya, shows off his gift -- healing and exorcism. During the deliverance ceremony he paces through the simple brick and tin church listening to the mumbles and shouts of prayer. He walks swiftly to a worshiper and thrusts his hands on the supplicant's head. "I command evil spirits to come out now in the name of Jesus," he repeatedly shouts in Kiswahili. His assistant hovers nearby with a tiny bottle of olive oil to smear on the site of offending aches and pains. From early morning the faithful trickle into his church on the outskirts of town, coming from across the district hoping this Christian pastor can exorcise their pagan demons. "They come for prayers to be released from the powers of witchcraft," says Omambia, who was excommunicated from the Catholic church more than a decade ago for emphasizing the occult. "Some are possessed by these demonic spirits, so they come forward for prayers to get healed." The pastor says he can heal cancer, epilepsy and possession and says that the power from his hands is like electric currents from Jesus. Of course it isn't all that unusual for a pastor to claim healing powers. Witness the blow-dried televangelists of America and elsewhere, who often advertise their dramatic healing powers in infomercials. But in western Kenya the belief in the supernatural is far deeper, and the line between Christianity and the occult is thin at best. Many here believe that witches, night-runners brandishing flaming torches and evil spirits populate the night. And lynch mobs often attack accused witches. A particularly gruesome incident occurred near Kisii in late May. Fifteen people, mostly elderly women, were murdered in a witch-hunt. Villagers say that more than 100 people gathered machetes and knives and stormed the village of Kegogi after midnight. They believed that the witches operated out of a school and compiled lists of those that they would curse. Five months ago, another five women were killed in similar circumstances. Omambia says witches should be sent to jail, not killed. That he, a Pentecostal preacher, believes in witches, rankles some more traditional Christians. The Bible seems pretty clear about people who practice the Occult: "For all who do these things are an abomination to the Lord"- Deuteronomy 18:9-12. But many Christians and pastors in Western Kenya believe in a complex mix of scripture and local traditions. "Witches are there," says the pastor, "but what we do here is more powerful than witchcraft." Omambia wears a somber suit when he battles the occult. He is small in stature, but he has piercing obsidian eyes. His sermons are of the fire-and-brimstone variety, but the content contains core Christian values like "love thy neighbor" and faith in Jesus. It is his deliverance ceremony that shows a different side of faith. Despite the theatrical nature of the ceremony, the Community of Christ Church doesn't charge for the laying on of hands, unheard of at the myriad prosperity-style churches and pastors that populate Nairobi, Kenya's capital. "This is not a business," says Omambia. "It is impossible to buy a gift from god." Kisii is a largely poor and rural part of Kenya. His church does take collection, but the flock normally can only afford to give coins, although his followers did contribute enough to build the church structure from scratch. Word of Pastor Lawrence's perceived powers has spread. Seventh Day Adventists, Catholics and Muslims send him photographs of themselves or their families to seek help. "I pray over the picture," said Omambia. "Even if they are not with us physically, we believe they are with us in the picture." He says he has helped people who send their photos to cure marital problems, asthma and possession -- and even get visas to the United States. And his followers say he is the real deal. "I had problems. I was sick," says Nora Buto, who believes a curse caused pregnancy complications. "I came here and he prayed on me like he was praying on other people. I got healed." After the deliverance ceremony she gave birth to a healthy baby boy. She christened him Lawrence Pastor.